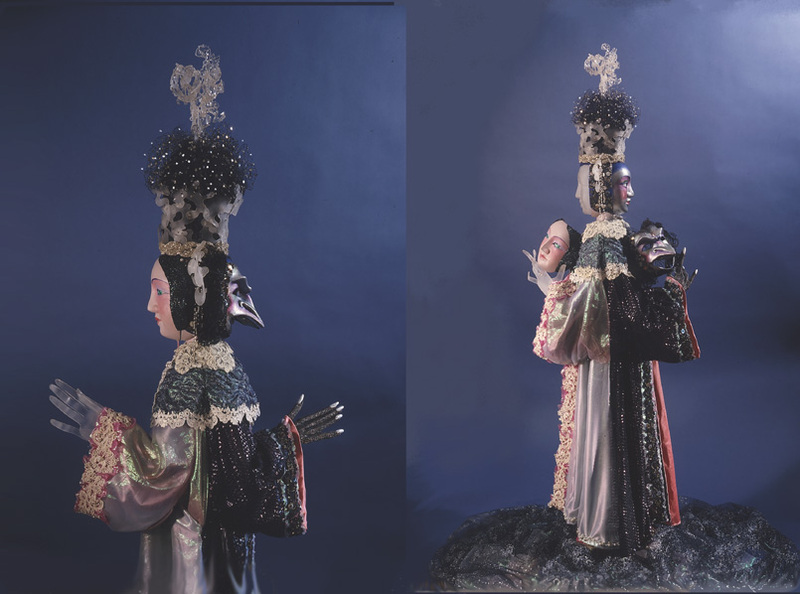 long mechanical puppet was inspired by the Bunraku traditional puppet theater of Japan as were his companions the Goddess of Earth and the Goddess of Heaven, which follow. 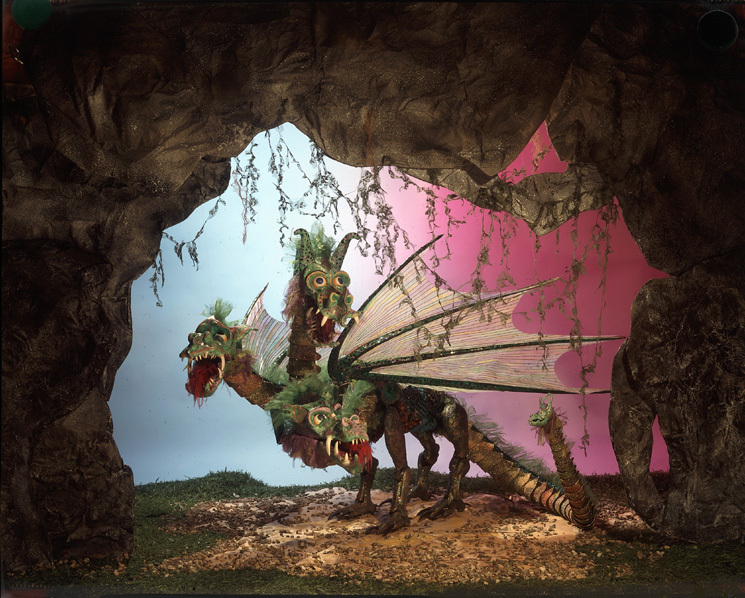 The Dragon is fully moveable; his wings open and close, his legs walk, his necks and tail are fully flexible, his eyes roll, each head a bit differently, and his mouths open and close to allow his "fiery" tongues to dart forth. 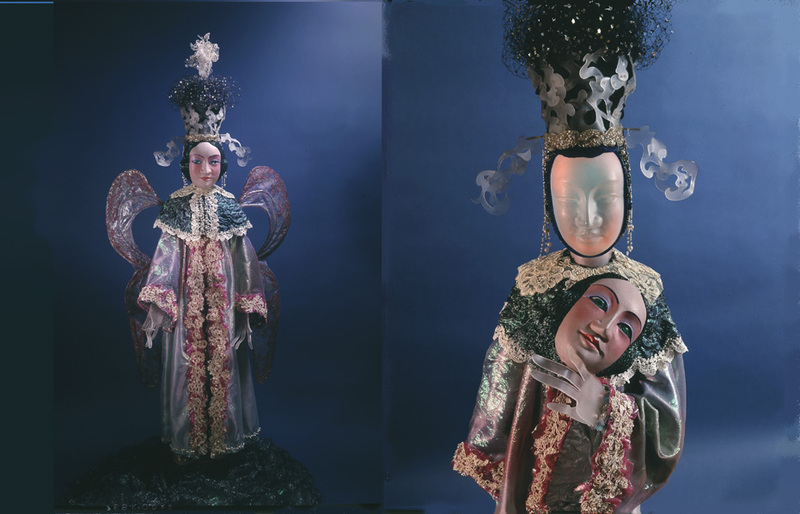 Goddess of Earth: this nearly life size puppet has two sides, which show alternately when the puppeteer spins her around. This side shows the beneficent side of Nature. 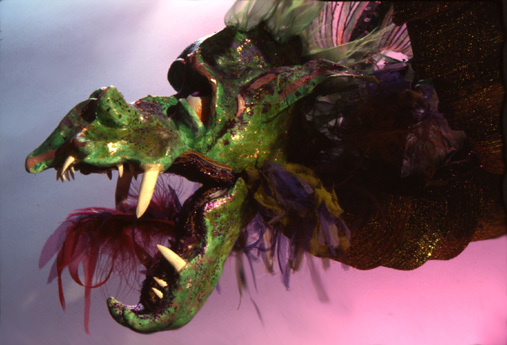 Her costume is sewn with faux flowers and fruit, and her eyes and mouth open and close. 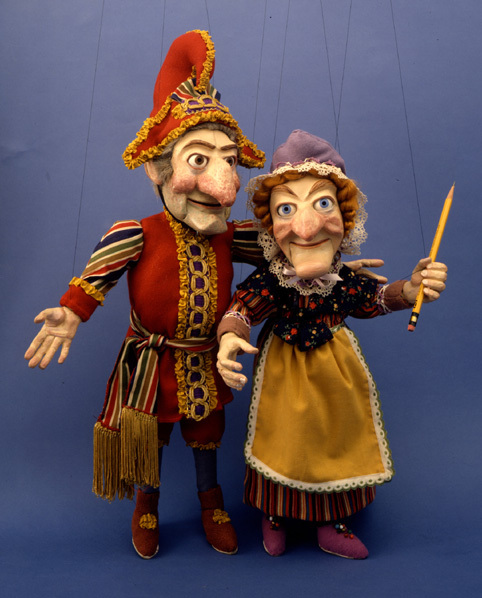 Goddess of Earth, cruel side: The opposite side of this puppet has a mask-like face of a deathly pallor, and blind eyes. A tiny crack down the center reveals that the face can open, when it does, it reveals the grinning skull, symbol of death and destruction. The skeletal hands are fully moveable. Goddess of Heaven: sister to the Goddess of Earth, she is two sided, but also four-faced, as each of the two sides of her head has a mask. 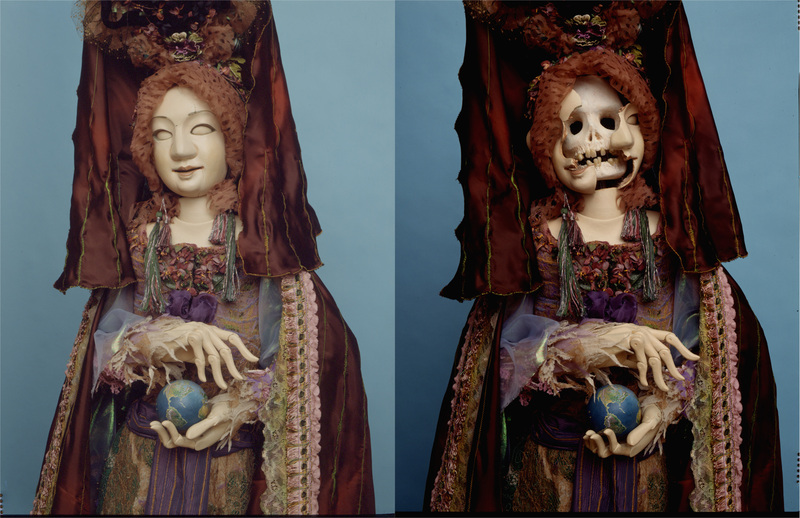 Left, the beneficent side, full view, with the mask on, right, with the mask removed. 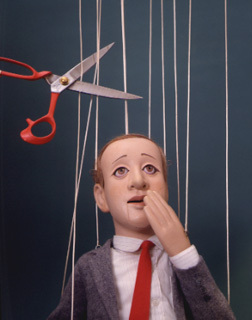 The inner light of the face represents the light coming from the sky, and its colors change, like the sky, by moving controls inside the puppet. 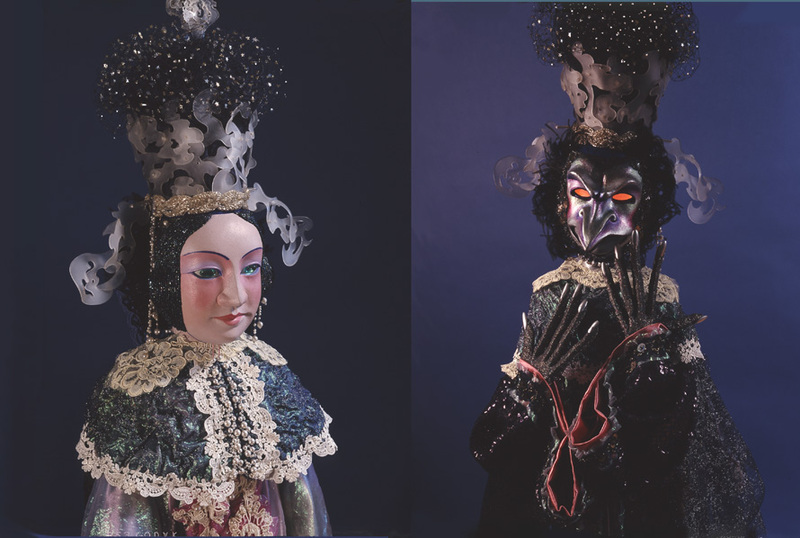 Details of Goddess of Heaven, left, kind side, right cruel side, with masks. The Asian tradition characterizes the Goddess of Storms as a bird of prey. 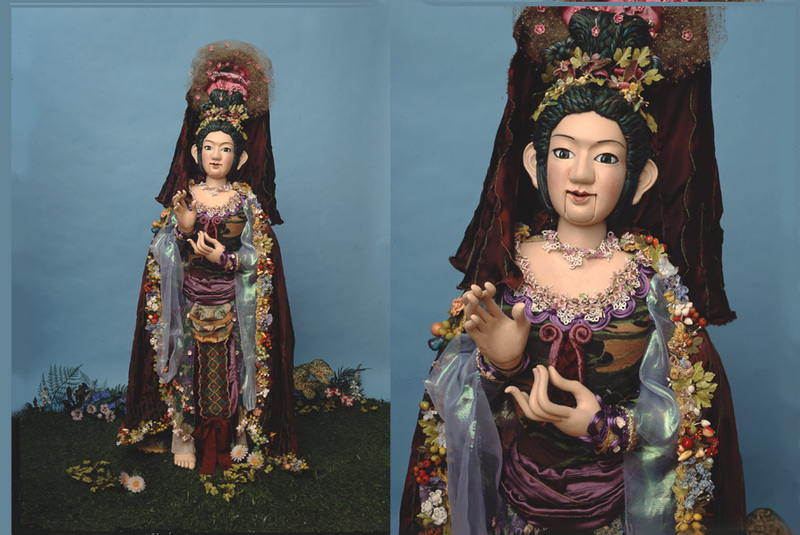 Goddess of Heaven, side views: These show how these puppets are made, so that they can change character simply by being turned. Left, with masks on, right, with masks off. 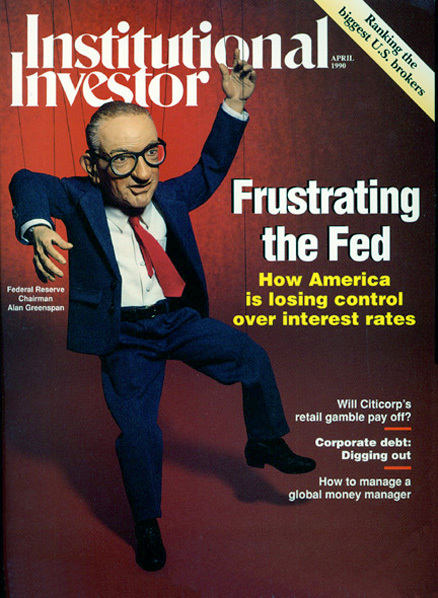 Two portrait puppets: Left, Alan Greenspan being manipulated by foreign currency, for magazine cover. 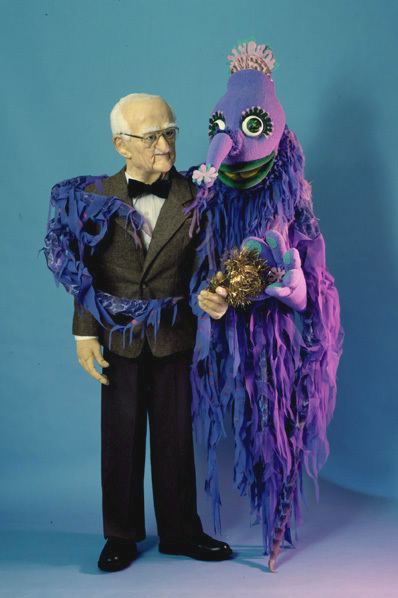 Right, Dr. Joseph Juran, originator of the concept of quality control, embraced by Zookie, the Queen of the Martians, a ventriloquist's figure done for a comedy routine. 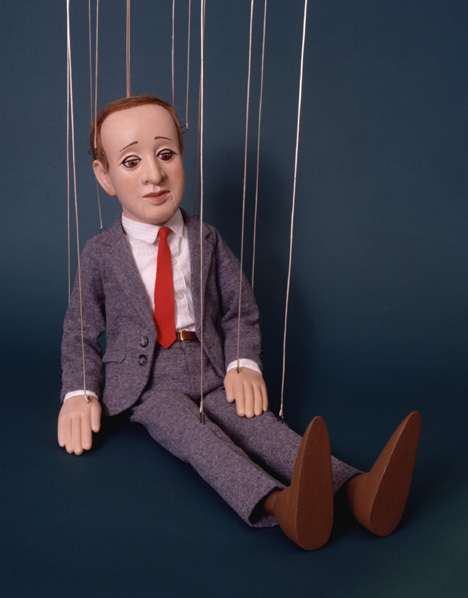 Right, Betablocker Man, heart patient for whom betablocker medication "cuts the strings" which are imposed by less convenient medications.